About 7,700 years ago Mt. Mazama blew its top. While I am no expert volcanologist, I’m reasonably sure that this was not your average eruption. Actual volcanologists tell us that the eruption was around 42 times greater than that of Mt. St. Helens in 1980, and since 42 isn’t a round number, I have to assume they aren’t just randomly guessing. But the exciting thing (if an explosion of molten rock out of the top of a mountain isn’t enough for you) is that this volcano just kept going until the entire thing had collapsed in on itself forming an impressively large caldera where a mountain top once stood. Over the years the steam vents sealed themselves off and the deep caldera became a giant bowl for catching precipitation and snow melt. Since the area receives an average of 44 FEET of snow per year (along with a measly 66 inches of rain), well, let’s just say that’s one big puddle! Today, nestled in 286 square miles of national park in the middle of Oregon, this former mountain peak is known as Crater Lake. 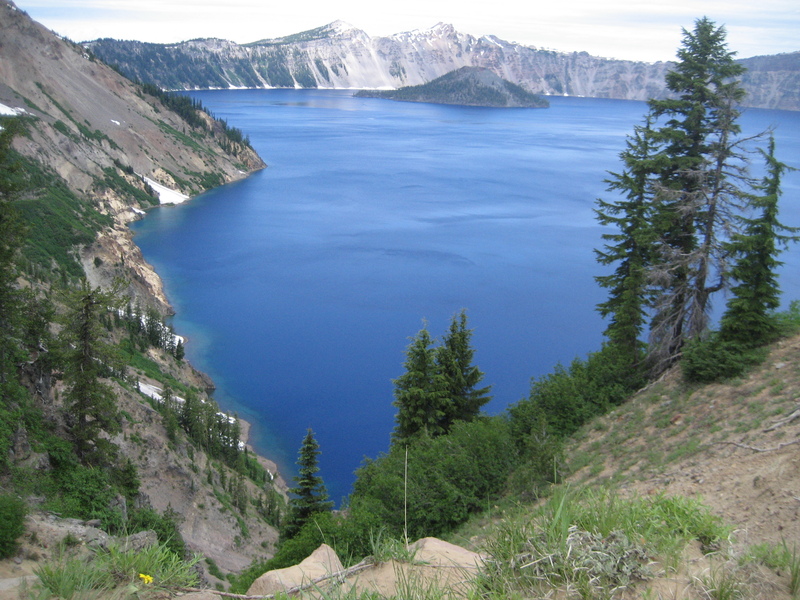 At somewhere around 2000 feet deep, it is the deepest lake in the United States and ranks seventh in the world. Of course since geologists can tend to be a quarrelsome bunch, it should come as no surprise that some have argued for naming it the ninth deepest in the world. I’m sure there’s a strong case for that, but, frankly, I lost interest. What really matters to me, is that with an approximate volume of 4.49 cubic miles of water, there’s more than enough room to comfortably support the Crater Lake Monster. It’s true that Crater Lake’s elusive pleisiosaur doesn’t have the vast following or pizzazz of its more publicity crazed Scottish cousin Nessie, but then given that the volume of Loch Ness is a mere 1.8 cubic miles, it makes sense that Nessie would be observed more frequently. Actually there have been shockingly few sightings of the monster in Crater Lake. To some skeptics out there, that might seem like good evidence that there is no such thing as the Crater Lake Monster. From where would it come after all? With no way in or out of the lake and no naturally occurring fish, it doesn’t at first seem like the ideal habitat for a sea monster. But at least one witness has come forward in the recent past with a compelling monster story. Mattie Fletcher of Albany, Georgia, recounted her terrifying tale in a May 2002 issue of her local newspaper. When the now adult Ms. Fletcher was a young child boating on Crater Lake, she recalls, she observed a shadowy something swimming beneath her rowboat. She says it resembled a dragon, which, if you’ve ever seen the 1977 B movie The Crater Lake Monster (and who hasn’t?) you recognize as a pretty accurate description, though she forgot to mention that it was slow moving and made of paper mache. And Ms. Fletcher is not the only person ever to claim that Crater Lake is home to a monster. Though numerous Native American legends surround the unusual body of water, the most consistent version tells of a battle between Llao (the god of the underworld) and Skell (the god of the sky). The story explains the massive eruptions of Mt. Mazama and how a demon soldier of Llao may have come to dwell in the depths of the lake. Regardless which version of the legend though, Native American tribes consistently viewed Crater Lake as ominous and guides generally led exploration parties around the area, avoiding the lake altogether. As a result it wasn’t discovered by pioneers until 1853 when a group of miners looking for gold stumbled upon it. I can kind of see why the lake might be a little unsettling. I recently visited the national park for the first time and the impossibly blue, incredibly deep waters that are difficult to access even in the height of summer do inspire awe. It’s the kind of place one expects to find a monster and to snap a picture of a long slender neck peaking up to say hello. Perhaps it’s only a matter of time until this monster has a cult following and a catchy nickname of its own. So maybe I do care if I ever get back.